The professional arborists at Sydney Tree Removals understand your concerns that you want to have your tree removed but have your plants and structures protected. When we carry out our professional tree services like tree felling in Pittwater we make sure we do it carefully and professionally. We are more than tree loppers, although we specialise in tree removal, we operate as tree surgeons. Our work is done with precision and competence so you can be confident in the tree service provided. Originally tree lopping in the Northern Beaches meant cutting down the tree to ground level. Now days we refer to it as tree removal. If you want half a tree cut you can ask for tree topping, but the best course of action is usually to meet up for a free quote and discuss your tree removal options in plain English. 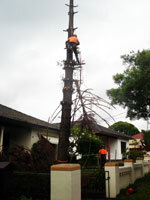 We can remove any tree in Pittwater using rigging methods, cherry pickers, boom lifts, and other arborist trade secrets. We know what to cut, where to cut, and how to cut it, so your tree can be remove efficiently, or pruned without leaving unsightly damage. 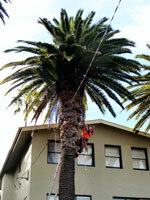 All our tree pruning in Pittwater is carried out in accordance with Australian Standards (AS 4373-2007). This ensures that the best industry practices are used on your tree and you can be confident in our workmanship. 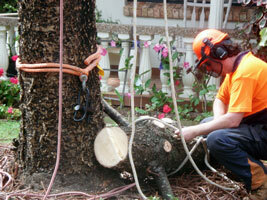 We are one of the best tree felling service in the Pittwater area and throughout the Northern Beaches. Just ask our customers or read reviews of us online. Our customers are happy about our excellent service and professional conduct. We pride ourselves of being able to safely perform tree felling for a reasonable tree felling price. There are many tree removal companies in Northern Beaches that say they offer similar tree services, but they often lack experience, qualifications, insurance and expertise, and become a huge liability and risk. Don't risk it with any tree felling company in your Northern Beaches area, call Sydney Tree Removals instead.